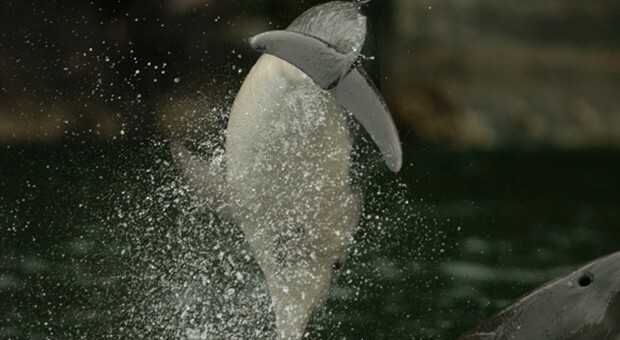 Bottlenose dolphins are found in most of the World’s coastal areas. Of the dolphins, only killer whales (which really are dolphins) have a wider distribution. While bottlenose dolphins can been seen off any New Zealand coast, they are most frequently seen in the Bay of Islands, the Hauraki Gulf, Tasman Bay, Golden Bay and Fiordland. 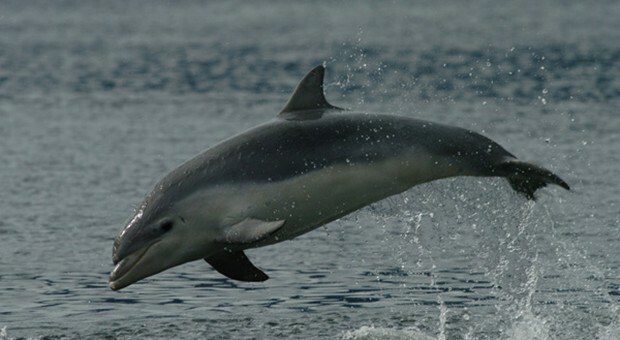 New Zealand’s bottlenose dolphins, particularly those in the far south, are among the largest bottlenoses in the world, reaching almost four metres in length, and weighing as much as a medium-sized horse. They are stocky – which is typical of cold water populations. Bottlenose dolphins reach sexual maturity between 7 and 12 years old. Mature females give birth to a single calf every 2-4 years. Maximum lifespan is at least 40 years. In Fiordland, births are highly seasonal – restricted to spring and summer. The timing of births is really important. Our latest research has shown that calves born early or late in the calving season have a much lower chance of survival. Calves are totally dependent on their mothers for the first six months, and become progressively independent over the next two years. In Doubtful Sound, our studies have shown that the resident dolphins have a much more stable society than elsewhere. Ties within the group are strong and long-lasting. This is unusual among dolphins, which, except for mothers and calves, typically have more casual social ties. Strong bonds in this community may be due to the habitat. Fiordland is almost as far South as bottlenose dolphins go. It may be that these dolphins need to co-operate more to survive near the limit of their distribution. It is clear that the cold of Fiordand is an important factor in where the dolphins go. In the coldest months, the dolphins avoid the extremely cold inner regions of the fiord. By contrast, in summer they favour the inner regions, which at that time are warmer. Bottlenose dolphins are incredibly adaptable. Ultimately, that’s why they are so widely distributed – they can modify their behaviour to adapt to almost any circumstance. Whether it is herding fish against the side of a boat, or beating their tail against a muddy bottom to create a visual barrier, these dolphins are capable of extraordinary co-operation to catch elusive prey. New Zealand Whale and Dolphin Trust sponsorship has been instrumental in continuing a long-term research programme on the Doubtful Sound dolphins. For over 20 years, researchers have studied their habitat use, ecology, behaviour and population trends and the impact of tourism. This long-term study that has uncovered some uncomfortable facts. Our most important work showed that this population has been in serious decline. The Doubtful Sound population gradually declined from 69 in 1994 to 56 in 2006. The decline was due to a sudden change in calf survival, which halved in 2002 and has stayed low. 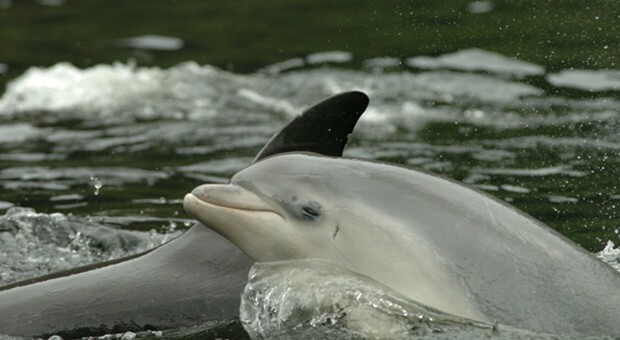 Calf survival in this population is the lowest of any bottlenose dolphin population. Lower even than calf survival in captivity. Potential reasons for the extremely low level of calf survival include tourism, ecological impacts of long-term fishing within the fiords and ecological and/or direct impacts of freshwater discharge from the Manapouri power station. The unique beauty of Fiordland supports a lucrative tourism industry. The dolphins, of course, are a key attraction. Even though the levels of tour boat activity are relatively low, in Doubtful Sound these activities can have clear impacts on the dolphins’ behaviour. While juveniles are often attracted to the boats, the adults, especially females with calves, usually avoid them. Mothers and calves usually avoid boats by “slinking” along the fiord walls or diving for longer. These reactions are most obvious when skippers ignore the rules imposed by the Marine Mammal Protection Regulations, approaching at speed, or head-on. Thankfully, skipper behaviour has improved, and the companies now follow a code of practice designed to reduce impacts. A local power station takes water from Lake Manapouri, runs it through hydro-electric turbines and then disposes of the water into Doubtful Sound. The height difference between the lake and the fiord makes this a very efficient power station. The problem is, the water can be much colder than the ambient temperature of Doubtful Sound, especially in winter and spring. This is an important time for the local dolphin population. The females go through the final stages of pregnancy in winter and give birth in spring. The young calves have to keep their own bodies warm for the first time, and are at their physiological limits. Cooler water temperatures at this time are a challenge. Add to that potential stress from approaches from tour boats and the relatively low food availability in the fiords, which are still recovering from the impact of past intense fishing pressures. We are not yet sure which of these human impacts are most critical and how the combined effect of several human activities affects the dolphins. This is the focus of our continued research. Research funded by the NZ Whale and Dolphin Trust has been crucial in the development of the current protection measures. Our research has raised the profile of these dolphins’ conservation problems, both nationally and internationally, to help them get the protection they need. Dolphin Protection Zones have recently been created, in areas that our research showed to be most frequently used by the dolphins. These are a step in the right direction. The protection zones extend 200m from the shoreline, in the areas indicated in red on the map below. Boats are allowed to enter these areas for fishing, diving, anchoring etc. Voluntary guidelines request that boats travel at a slower speed (5 knots) than elsewhere in the fiord, and do not enter Dolphin Protection Zones if dolphins are seen. Protection of the Doubtful Sound dolphins could be improved by further reducing the effects of tourism and other human impacts. For example, by increasing the size of the Dolphin Protection Zones and turning the voluntary guidelines into regulations. The amount of freshwater input into Doubtful Sound could be reduced, especially in late winter and early spring which are critical times for dolphins in the final stages of pregnancy and newborn calves. Young calves are especially vulnerable to human impact. We are interested in determining how effective these measures are. Elliott, R.G. Dawson, S.M. and Henderson, S.D. In Press. Acoustic monitoring of habitat use by bottlenose dolphins in Doubtful Sound, New Zealand. New Zealand Journal Marine and Freshwater Research. Currey, R.J.C., Dawson, S.M., Schneider, K., Lusseau, D., Boisseau, O.J., Haase, P. Slooten, E. In Press.Inferring trends and causal factors for a declining population of bottlenose dolphins via temporal symmetry capture-recapture modelling. Marine Mammal Science. Elliott, R.G., Dawson, S.M. and Rayment, W. J. 2011. Optimising T-POD settings and testing range of detection for bottlenose dolphins of Doubtful Sound, New Zealand. Journal of the Marine Biological Association, UK. doi:10.1017/S002531541100035X. Rowe, L.E., Currey, J.C., Dawson, S.M. and Johnson, D. 2010.2 Comparative assessment of epidermal condition and calf size of Fiordland bottlenose dolphin populations using dorsal fin photographs and photogrammetry. Endangered Species Research. 11: 83-89. Currey, R.J.C., Dawson, S.M. and Slooten, E. 2009. Conducting a regional threat assessment under IUCN Red List criteria: the Fiordland bottlenose dolphins are critically endangered. Biological Conservation 142:1570-1579. Rowe, L.E. and Dawson, S.M. 2009. Determining the gender of bottlenose dolphins (Tursiops sp.) using dorsal fin photographs. Marine Mammal Science 25(1): 19-34. Currey, R.J.C., Rowe, L.E., Dawson, S.M., Slooten, E. 2008. Abundance and demography of bottlenose dolphins in Dusky Sound, New Zealand, inferred from dorsal fin photographs. New Zealand Journal of Marine and Freshwater Research 42: 439-449. Rowe, L. E. and Dawson, S.M. 2008. Sexual dimorphism in dorsal fin size in a population of bottlenose dolphins from Fiordland, New Zealand. Australian Journal of Zoology 56: 239-248. Currey, R.J.C., Dawson, S.M. and Slooten, E. 2007. New abundance estimates suggest Doubtful Sound bottlenose dolphins are declining. Pacific Conservation Biology. 13: 265-273. Lusseau, D., Slooten, E. and Currey, R.J.C. 2006. Unsustainable dolphin-watching tourism in Fiordland, New Zealand. Tourism in Marine Environments 3: 173-178. Higham J.E.S. & Lusseau D. 2004. Ecological impacts and management of tourist engagements with marine mammals. In: Environmental Impacts of Ecotourism (R. Buckley ed. ), pp. 173-188. CAB International Publishing: Wallingford. Lusseau D. 2003. The emergent properties of a dolphin social network. Proceedings of the Royal Society of London B 270 S1: S186-S188. Lusseau D., Schneider K., Boisseau O.J., Haase P., Slooten E. & Dawson S.M. 2003. 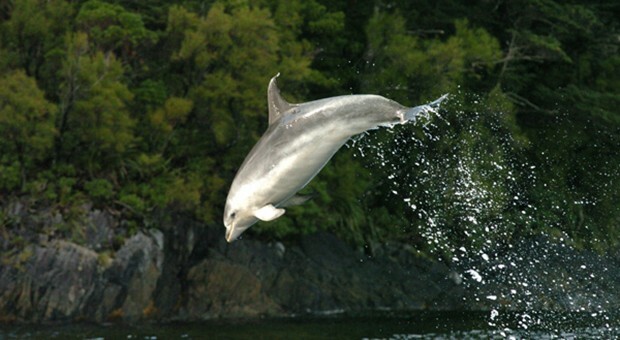 The bottlenose dolphin community of Doubtful Sound features a large proportion of longlasting associations. Behavioral Ecology and Sociobiology 54(4): 396-405. Lusseau D. 2003. The effects of tour boats on the behavior of bottlenose dolphins: Using Markov chains to model anthropogenic impacts. Conservation Biology 17(6): 1785-1793. Lusseau D. & Higham J.E.S. 2003. Managing the impacts of dolphin-based tourism through the definition of critical habitats. Tourism Management 25(6): 657-667. Lusseau D. 2003. Male and female bottlenose dolphins have different strategies to avoid interactions with tour boats in Doubtful Sound, New Zealand. Marine Ecology Progress Series 257: 267-274. Haase, P.A. and Schneider, K. 2001. Birth demographics of bottlenose dolphins, Tursiops truncatus, in Doubtful Sound, New Zealand preliminary findings. NZ Journal or Marine and Freshwater Research35: 675-680. Schneider, K., Baird, R.B., Dawson, S.M., Visser, I. and Childerhouse, S.J. 1998. Reactions of bottlenose dolphins to tagging attempts using a remotely-deployed suction-cup tag. Marine Mammal Science.14(2): 316-324. Williams, J.A., Dawson, S.M. and Slooten, E. 1993. Abundance and distribution of bottlenose dolphins (Tursiops truncatus) in Doubtful Sound, New Zealand. Canadian Journal of Zoology 71: 2080-2088.